Our construction IT services are specifically designed to support the technological needs of construction firms. We understand that construction firms run their businesses differently from office-based businesses and even from other types of service providers. Because construction companies operate mainly from the field and may run several jobs at one time, they have a unique set of requirements in addition the basic expectations most organizations have from their IT companies. Fortunately, ICS is positioned to provide comprehensive construction IT services, from the basics to more sophisticated supports that are geared toward construction firms like yours. Advanced IT Support: ICS delivers the IT products and services that most organizations today require to run their businesses, including desktop and server support, file servers, technology vendors, email services, backup storage, and disaster recovery. Virtual Private Networks: At ICS, we understand that constructions firms may need to access to their files anytime, anywhere, as well as the ability to utilize project collaboration tools and other mobile technologies in real time. VPNs enable you and your team to access project files from any location, streamlining project management. Extended Support Hours: Most construction companies don't follow a 9-5 schedule, and our construction IT services don't either. 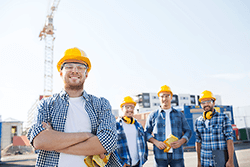 The work day typically starts pretty early in the construction industry, so we provide extended support hours to fit these industry-specific schedules. You won't have to wait until 9am to speak with a support technician at ICS. We also offer 24/7 emegency IT support. Remote Access: Not only can your employees access your server remotely, but we can, too! If you're having an issue with your network, server, or device, the last thing you want is to have to leave the job site and head back to the office so that we can fix the problem. With remote access technology, we can gain entry to your network and your devices, no matter where you are. With less downtime, you'll finish projects more quickly, which results in more happy customers! Third-party software vendor support: As the construction industry increasingly embraces the idea of leveraging technology to improve service delivery, more and more third-party vendors are rolling out new software that caters specifically to this arena. Whether your firm has always been an early adopter of the latest tech or is hopping on the bandwagon later than most, you'll nonetheless require software-specific support from time to time. Our construction IT team is familiar with many types of third-party construction software applications, such as Foundation, Quantum, HeavyBid, Procore, Sage300 and Bid2Win software. We can install the software, work with the publishers to apply fixes to any existing bugs, and even call them on your behalf in the event of an unknown issue. E-Signature Technology: E-signatures will help streamline your document process and ultimately speed up project timelines. We can implement e-signature technology for your construction company so both you and your clients can sign documents from anywhere in the world. Purchase orders, change orders proposals, agreements, and any other documents holding up a project can be taken care of instantly. Cloud-based technology support: Using cloud-based technologies allows you to ditch the paper, sending invoices and receiving payments online, enabling your employees to clock in and out remotely, and allowing you to create project work orders, send out bids, respond to problems, and access master schedules on the fly. Cloud-based services are among the most popular construction IT services we offer, as they provide you access to powerful processing and storage technologies that keep your business running smoothly and efficiently. With construction IT services, you'll be able to boost productivity and efficiency while protecting your organization from costly errors. More flexibility, improved communication, and access to dynamic technologies and applications enable you to complete projects quickly, exceeding your customers' expectations and giving you an edge over competing firms. Contact ICS today to see how our construction IT services can help you take your construction firm to the next level!